We’ve stopped developing G-Tools and hence it’s no longer available for sale but if you’re an existing customer, you can continue to use it for as long as you like. Because existing customers can continue using G-Tools, YOUtools isn’t a replacement or upgrade of G-Tools, rather a brand-new product. We don’t offer a discount for purchasing YOUtools because the price has already been reduced from $79 to $29 even though YOUtools has many more features. If you like what you see in YOUtools, you can purchase a perpetual license here before the introduction of a subscription model. G-Tools was our first “Design Studio” add-in for PowerPoint. With Microsoft’s recent extended support for add-ins that run within PowerPoint:mac 2016 (as opposed to the new web-hosted Office add-ins), we decided to build a new product. As a result, we’re currently phasing out development and support for G-Tools. If you are an existing G-Tools license, you can continue to use the product indefinitely but we will not be providing new Microsoft Office compatibility releases as of the end of July 2018. 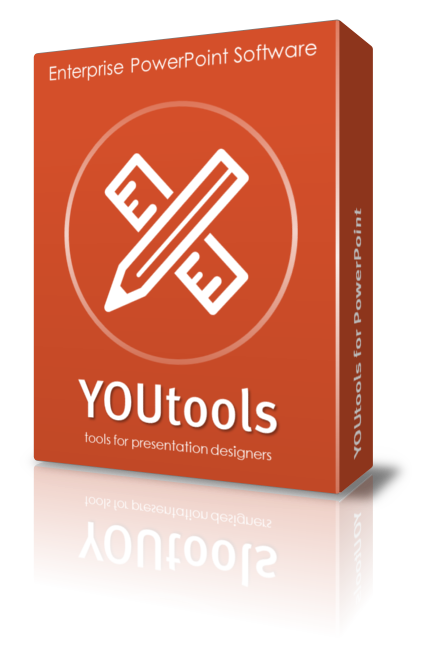 Our new design studio tools product is called YOUtools and it runs on both PC and Mac* versions of PowerPoint 2016 onwards. We will continue to integrate selected features from G-Tools to YOUtools that can be supported on PC or Mac or both. Some won’t make it. For example, Microsoft have ended support for Flash and disabled it in Office 365 as of May 2018 so the Insert Vimeo feature that’s available in G-Tools will be recalled. EPS graphics support has also been withdrawn by Microsoft from all Office 365 applications due to security concerns. For these reasons, G-Tools will no longer be made available for sale. We’re redesigning and improving features as we integrate them from G-Tools. For example, the Guides Layout feature is now amazing! If you see a feature that you use in in G-Tools that’s not yet in YOUtools, let us know. *Not all features that run on YOUtools when installed on a PC are available when installed on a Mac, for example, Guide Layouts are not supported on Mac (due to Microsoft not opening up the programming interfaces we need).